Flash drying is an inexpensive solution to drying powders and granular materials, and is designed for high moisture materials with a constant-rate drying zone. Carrier’s industrial flash dryer systems can use higher gas temperatures, versus other dryer types, because the material retention time is very short. Flash drying is accomplished with a large quantity of gas and active heat exchange, which simultaneously transports the processes materials. Drying materials with high moisture contents in the constant-rate drying zone. High temperature drying gas is blown into the duct, where material is continuously fed, dried, and transported. 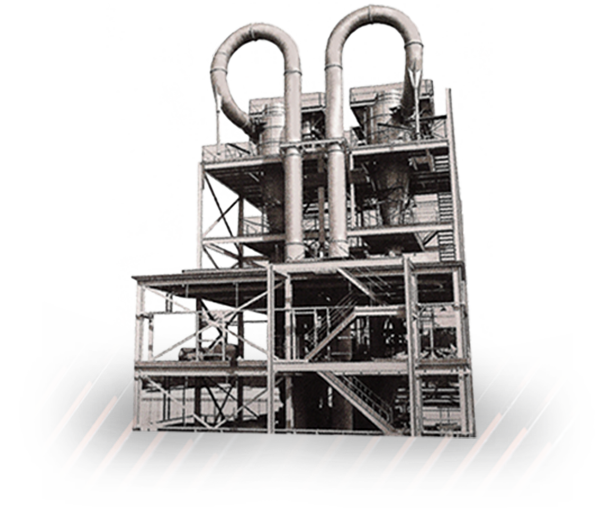 The processed material is separated from the exhaust gas and collected by a cyclone or bag filter in the flash dryer system. Capable of processing high capacities in a relatively small amount of space. Often used as a pre-dryer to expand production capacity on existing lines. High thermal flash drying efficiency. *For dispersion of material, de-agglomeration equipment, such as a Cage Mill or scatter is used. Carrier offers to quote these items as an option. If size reduction is not desired, a mechanical slinger is available for the flash dryer system to disperse sticky materials. Pneumatic conveying while flash drying eliminates additional equipment. High process gas temperatures possible for reduced size and cost. Industrial flash dryer systems designed for easy installation. For more information on Flash Dryers, refer to brochure #16512.